The comments come a week after he blasted the movement as hurting Lower Manhattan. 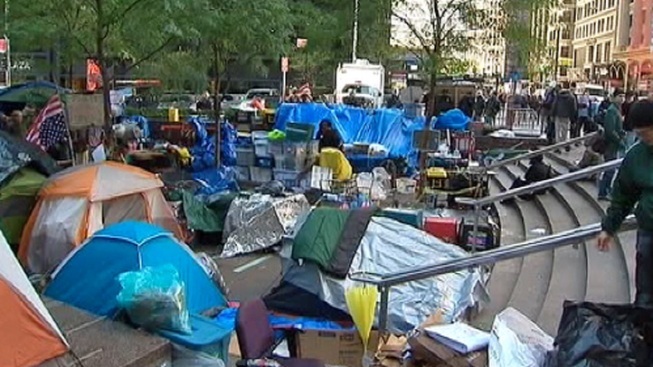 One week after Mayor Bloomberg said the Occupy Wall Street camp downtown was hurting businesses and families, the billionaire now says the protesters are law-abiding folks having little effect outside their small plaza. Bloomberg also declared the movement "is part of a much bigger thing that we should be focusing on." "I will say, in all fairness to the people down there, we watch very carefully, they generally do not break the law," Bloomberg said on MSNBC's "Morning Joe" program Wednesday. "When they protest, they march in a line, they stay on the sidewalks, they follow the direction of the police, they exercise their First Amendment rights... And we haven't seen the kinds of things you see in other cities where people are running through the streets destroying commerce and reputation," he said. "If you go one block away from this park, you would never know it exists," he went on. "It's just literally -- in any direction, one block away -- there's just nothing." Watch the interview here. Occupy Wall Street comes up at about 13:30. Last week, Bloomberg griped that Lower Manhattan was suffering under the movement that began Sept 17. "This isn't an occupation of Wall Street," he said at the time, "it's the occupation of a growing, vibrant, residential neighborhood in Lower Manhattan and it's really hurting small businesses and families.". Bloomberg said last week that the city had been working hard to preserve the First Amendment rights of the Zuccotti Park protesters. "But," he added, "other people have rights too and I am very concerned about their rights as well as those of the protesters." The protest, which began in Lower Manhattan and has spread to cities nationwide, has presented a tough situation for the third-term mayor, who has long sought to cast himself as a defender of First Amendment rights. After some initial scuffles between police and protesters, the city has remained largely hands-off, interfering only occasionally, like when the FDNY removed generators and gasoline cans that protesters were stockpiling for the winter.